It’s summer time and I keep seeing mouthwatering photos of beef everywhere I look! We grill a lot of steaks in the summer but sometimes I’m looking for something a little bit different. 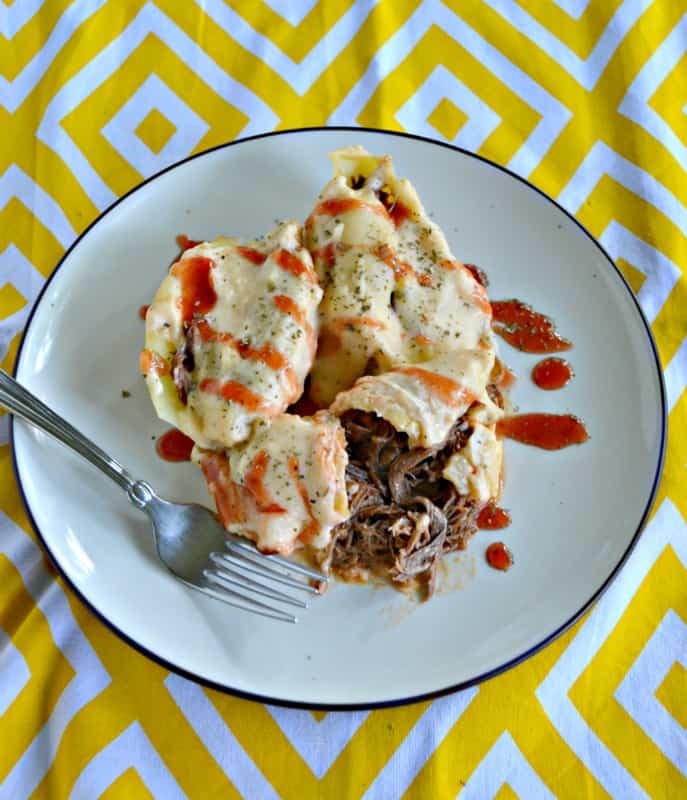 It seems like beef brisket is part of a lot of recipes right now and I couldn’t wait to bring my idea for BBQ Brisket Stuffed Mac N Cheese Shells to life now that I’m off work for the summer! When I went to my local Weis Markets I couldn’t find any beef brisket. I had this great idea in my head that I wanted to make but no way to make it. I talked to the manager in the meat department and he told me to hold on while he checked to see if they could order it. It turns out while they couldn’t order a whole brisket they could order a Certified Angus Beef® brand brisket flat. That was exactly what I was looking for and I ordered it on the spot! The manager told me it would be delivered in two days. I thought that was really fast and thanked him. Two days later Baby J and I headed to the market around noon and went right into the meat department. Once I arrived the manager explained that they couldn’t get the beef brisket flat so they had sent him the entire brisket. He asked me if I would like him to cut the flat part off for me and I agreed. He then asked if I wanted him to trim off all of the fat. I told him to leave a quarter inch of it and he smiled saying that was a good idea to give it some flavor. I felt like that was the right answer and smiled to myself as I browsed their delicious selection of Certified Angus Beef® brand beef while the butcher cut my brisket. It came out a few minutes later and looked just about perfect. I quickly went home and mixed up a BBQ flavored rub. When you have a brisket it’s a good idea to put a rub on in advance, wrap the brisket up, and let it rest for several hours. I put mine in the refrigerator over night. In the morning I heated the oven and popped the brisket in a pan. I baked it for an hour and then took it out. Since it’s summer and we have no air conditioning and it’s been hot I finished it off in the pressure cooker. When you do it in the pressure cooker it comes out tender and is ready in less then half the time that it takes when you make it in the oven. I’ve put directions for both ways in my recipe. Once it was finished I shredded it and added my favorite BBQ sauce. 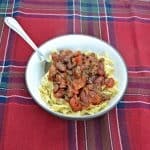 You can use your own homemade sauce or choose a sauce that you enjoy. I used a ready made sauce because I had some on hand and I was already making my own cheese sauce. Let me tell you, it was eight in the morning as I was shredding that beef and I snacked on a lot of it. It was so tender and so flavorful I just couldn’t stop myself! Next I cooked the shells and worked on the cheese sauce. There is nothing quite like homemade cheese sauce for Mac N Cheese. It’s much easier to make then you think. I started with a basic bechamel sauce and then added the cheese to that. This makes for a smooth and creamy sauce that can’t be beat! 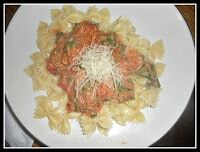 I added sharp cheddar cheese and cream cheese to my sauce but you can play around with different type of cheese to suit your own tastes. At this point I was basically ready to grab a spoon and just pour the cheese sauce over top of the BBQ brisket and call it a day. Thankfully I was able to stop myself and instead I stuffed the shells. Baby J woke up while I was stuffing them but it’s easy enough to do that I stuffed them while holding Baby J. You will have about twice as much brisket as you need to stuff the shells so make sure you stock up on slider buns and either pickles or cole slaw to add to your BBQ Beef Brisket Sliders. They make a delicious lunch or dinner! Plus, I love making meals where there is enough to enjoy two very different meals out of one basic recipe. This is one of those recipes. Once the shells were stuffed I poured the cheese sauce over top of them and popped them in the oven. The smell from the oven was a-mazing! I could smell the beef, BBQ sauce, and cheese. I mean, what’s not to like with that combination? The BBQ Brisket Stuffed Mac N Cheese Shells were finally ready to go. I served them up with a side salad and that’s all we needed. Let me tell you, I could barely shovel these in my mouth fast enough! 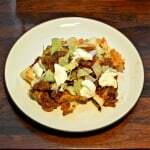 The combination of the tender shredded beef, the tangy BBQ sauce, and the rich cheese sauce was complete perfection. Plus it’s all stuffed inside pasta so you know I loved it. I even gave Baby J a piece of the pasta with cheese sauce which he seemed to enjoy as well. This is a great meal for when you have company because it looks really complicated, it serves a ton, and it’s really good. 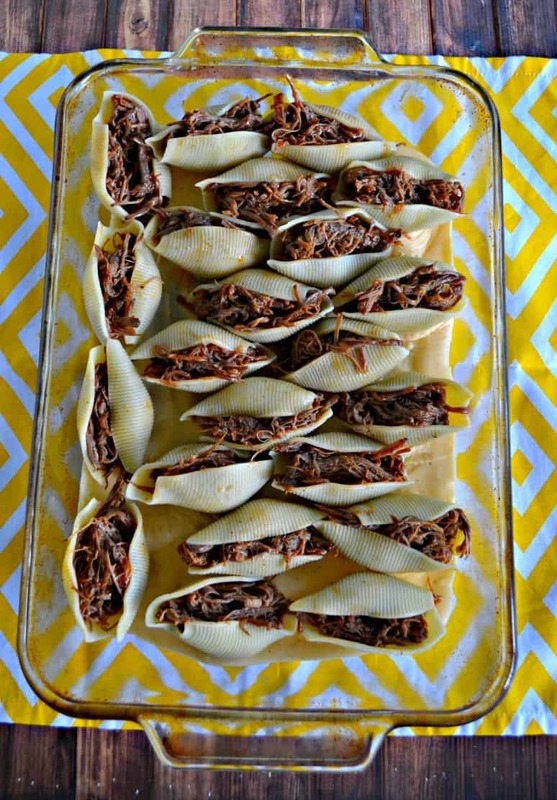 Plus you don’t need many side dishes when you serve beef stuffed inside pasta. You can also make all the parts a day ahead of time and then put it all together before you need to cook it. You could also make everything, stuff the shells, pour the cheese sauce over top, and then cover and refrigerate for up to 24 hours before cooking. I love dishes that I can make ahead for company. So what are you waiting for? 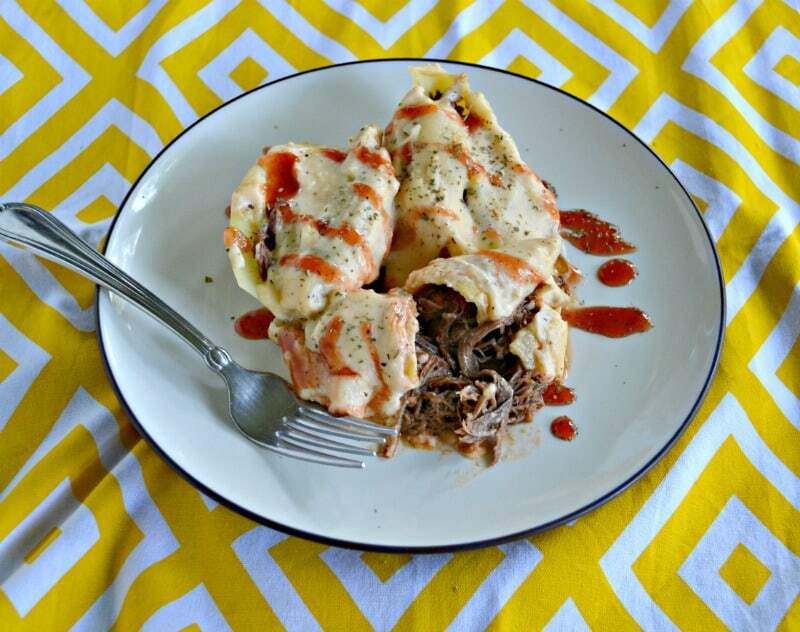 Get to your local market and pick up a Certified Angus Beef® brand brisket flat and get making these BBQ Beef Brisket Stuffed Mac N Cheese Shells for dinner tonight! 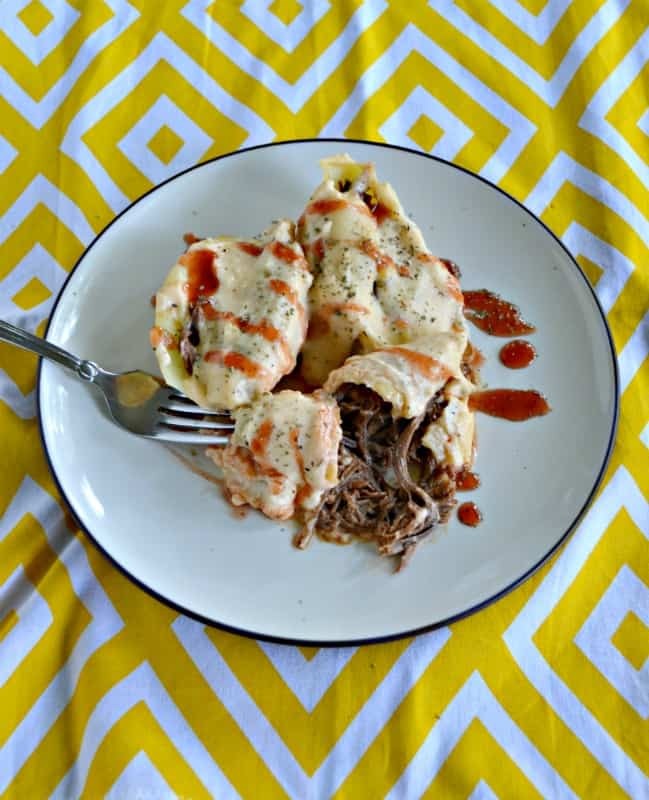 Make a beef and pasta dish that will knock everyone's socks off with this tender BBQ Beef Brisket Stuffed Mac N Cheese Shells with homemade cheese sauce! In a small bowl combine the salt, pepper, paprika, brown sugar, garlic powder, chili powder, and onion powder. Mix well. Rub the mixture on all side of the beef. Place the beef in a baking dish, fat side up, and bake for 30 minutes. Flip the beef over and bake for an additional 30 minutes. If continuing on in the oven lower the temperature to 275 degrees and put the beef broth in the bottom of the baking dish. Turn the beef so the fat cap is on top and cook for 3-4 hours or until tender. 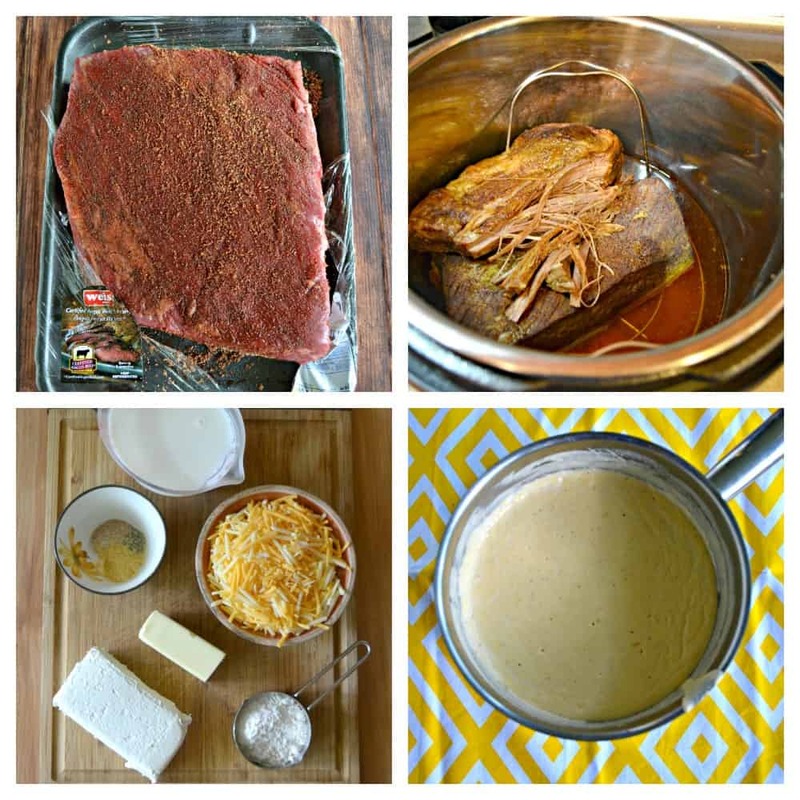 If making in the pressure cooker cut the brisket in half and place in the pressure cooker on a small rack. Add in the beef broth. Put the lid on and bring the pressure cooker up to high pressure. Cook for 50 minutes. Allow the pressure to release naturally for 20 minutes then release the remaining pressure. Remove liquid from the pan, reserving ½ cup. Place the brisket on a cutting board and use two forks to shred the beef. 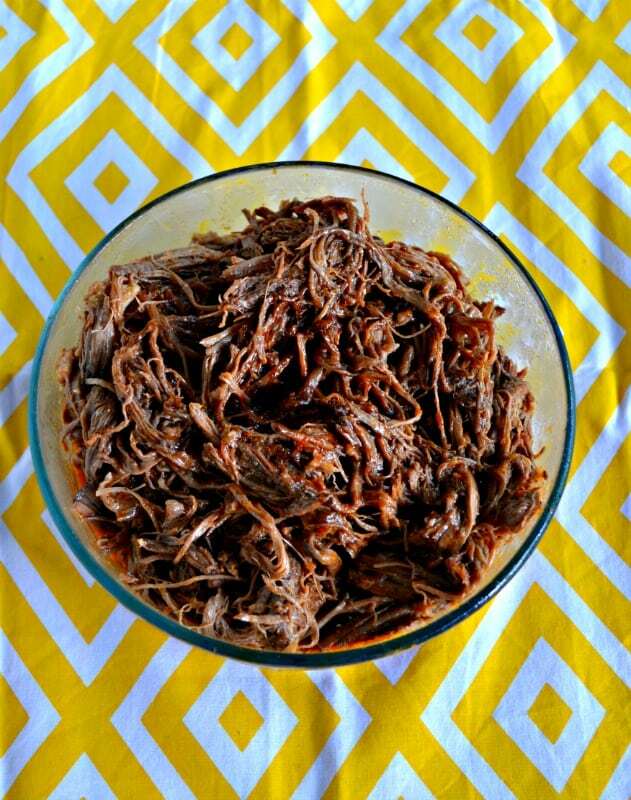 Place the shredded beef in a large bowl along with the ½ cup of reserved liquid and the BBQ sauce. Mix well. Cover the bowl and place in the refrigerator until ready to use. To make the cheese sauce melt the butter in a large saucepan over medium heat. Whisk in the flour until the mixture is smooth. Continue whisking over medium heat for 3-4 minutes or until the flour begins to brown. Add in the salt, pepper, mustard, and garlic powder and mix well. Add the cheddar cheese in a half cup at a time, whisking frequently, until the sauce is smooth. Stir in the cream cheese and continue mixing until it is incorporated. Heat the cheese mixture over medium heat for an additional 3-5 minutes, whisking frequently, until it has thickened but is still smooth. Remove from heat. Cook the shells according to the package direction. Drain and run under cold water. Preheat the oven to 375 degrees. Pour 1 cup of the cheese sauce in the bottom of a 9 x 13 pan. Pick up a shell and stuff it with the BBQ beef brisket then place in the pan. Repeat with remaining shells. I needed an additional 8 x 8 pan to hold all the shells. You will have brisket remaining. Place it back in the refrigerator to use later. Pour the remaining cheese sauce over top of the shells in the pan. Bake for 15-20 minutes. Remove the pan from the oven and sprinkle with parsley then drizzle with BBQ sauce. Looking for more beefy ideas? Join the Certified Angus Beef® Kitchen for beef recipes, beef discussion, and more! Brisket is a thing I have tried to make a couple of times. Not sure what my problem is – maybe it’s patience. I can never get it the way I want it. I might need to look at getting this certified angus beef to try it next time instead. It’s really tasty! Brisket takes time so I totally get that. 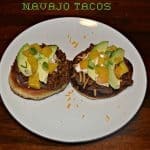 Using the oven then the InstantPot makes it a lot faster and it comes out pretty tender.